expressive possibilities of camera angle. He realized that, in general, if the subject is seen from a high angle (that is, the camera is shooting from above and thus down at the subject) the character will appear humbled or diminished. If, on the contrary, the subject is seen from below (that is, the camera is looking up at the subject), the character will appear imposing and confident. At the beginning of the film, before he is demoted from his position of doorman, Murnau films Jannings in close-ups and slightly from below, emphasizing his feelings of pride and self-importance. (See figure 14.) When he is obliged to unload a heavy trunk from a carriage, we see him looking up at the intimidating object. Murnau photographs him from a high angle (the camera shooting down at him) to emphasize his feelings of diminishment. (See figure 15.) Then we see the trunk, from his point of view. Shot from a low angle, it seems all the more burdensome. Finally the camera shoots down at the doorman to emphasize his struggle to lift it off the carriage. 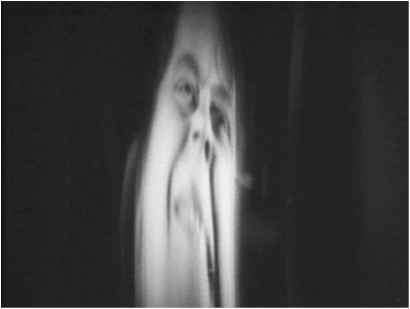 Murnau, in collaboration with his cameraman Karl Freund and his screenwriter Carl Mayer, added a new dimension to the expressiveness of cinema by "unchaining" the camera. When The Last Laugh was made, most directors shot their actions with a static camera, employing camera movement only to make action scenes more exciting. In Griffith's lastminute rescues, for example, a moving camera was sometimes mounted on a truck which drove alongside or in front of the rescue vehicle (horses, trains, carriages, etc.) to lend kinetic dynamism to the shot. Eisenstein mounted a camera on tracks that extended the length of the Odessa Steps so that he could intensify the effect of the spectacle of the fleeing citizens by following their movement down the stairs with his camera. 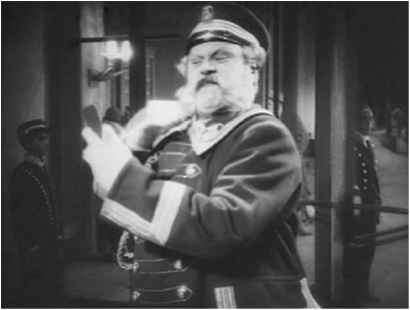 A subtle example of the use of the moving camera to intensify a dramatic incident occurs when the doorman returns to work the day after losing his job but still wearing his old uniform. He has gotten drunk at the wedding party of his niece the night before and has apparently forgotten about his demotion to bathroom attendant. As he approaches the hotel, we see through his point of view an image of the doorman who has replaced him standing at his post in front of the hotel. The shot begins as a long shot of the new doorman and is slightly out of focus. The camera then begins to move in closer and closer to the new man until the lens is sharply focused on the face of the doorman's replacement. The slow camera movement and the gradual sharpening of the image perfectly convey the old doorman's reluctant but dawning recognition that he has been supplanted. When another neighbor woman7 discovers the doorman at his lowly new post as bathroom attendant, the moment is given striking dramatic emphasis by a camera movement. We see a shot of the old man taken from outside the bathroom as he timidly opens the lavatory door and peers out to determine who has come to see him. At this point there is a POV shot of the neighbor woman (who has come to bring him lunch) looking back at him. As she opens her mouth to scream the camera lunges toward her until we see her face in an extreme close-up, framing only her eyes and nose. 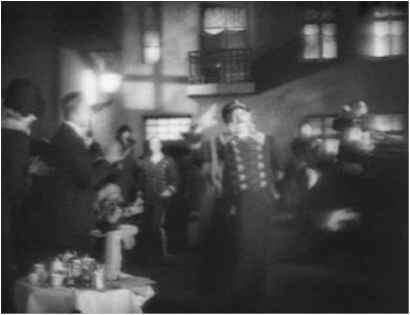 In contrast to the shot described above, in which the camera movement signifies a slow dawning of realization, here the lunge of the camera re-creates the feeling of an unexpected shock—both the woman's shock at seeing her idol so fallen and the ex-doorman's shock at being discovered. 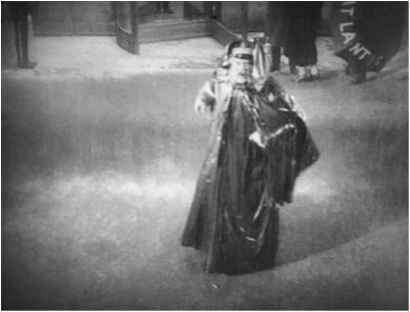 Murnau also uses the moving camera to transfer viscerally to the viewer the doorman's drunken dizziness on the morning after the wedding party. As he sits down in a chair, he begins to start reeling through space. 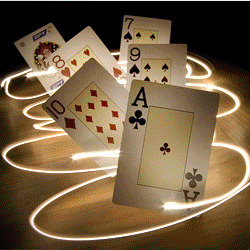 This effect was achieved by placing Jannings on a turntable device that swung back and forth, and then following his movement with the camera. Then we see a POV shot of the room spinning around. Here the cameraman Freund staggered about the room like a drunken man with the camera affixed to his chest. In both shots, the drunken man's vertigo is transferred onto the viewer. Shortly thereafter, the ex-doorman falls asleep and dreams he still has his old job at the hotel. In his dream he effortlessly lifts an enormous trunk from the top of a hearselike coach and parades with it into the hotel lobby. To the enthusiastic applause of hotel staff and patrons, he repeatedly tosses the trunk into the air and catches it with one hand. The dream is obviously a wish-fulfilling denial of reality. The previous day he had desperately tried to convince the manager of the hotel that he still had the strength to be a doorman by lifting a heavy trunk in the manager's office. The trunk overpowered him, sealing his fate as a lavatory attendant. Camera movement plays a large part in drawing the audience into the experience of the old man's drunken dream. The camera swishes erratically over the faces of the hotel patrons applauding the old man's prowess with the trunk. At first this shot seems to be a subjective shot: that is, the admiring faces of the patrons are apparently seen from the point of view of the dreamer. But, suddenly, the camera pulls back to capture the dreamer objectively. Here the shift from a subjective to an objective perspective within one shot cinematically re-creates the experience common in dreams that one is simultaneously experiencing an event and watching oneself having the experience. The unpleasant tilting and jiggling of the camera, combined with the manic grandiosity of the content of the dream, has an irritating and disquieting effect, reminding the viewer that the doorman's glorious comeback is only a drunken fantasy. The dream sequence described above is further enhanced by another special photographic effect, the use of multiple superimposed images to approximate the common dream phenomenon that Freud referred to as "condensation," the merging of two separate people or places into one composite image. Here Murnau superimposes images of the hotel dining room upon images of the doorman's tenement neighborhood. (See figure 17.) The fusion of these separate places into one space underlines the fact that the old man's prestige at work is vital to his well-being at home. What does "last laugh from an angle" ? What technique wa sused in the last laugh?